You are in: News - Getting High On Business! As a member of the Lisburn BNI Chapter and during our internal BNI game, Andy Wilson of Keyhole Surgery Locksmiths was a member of the winning team. 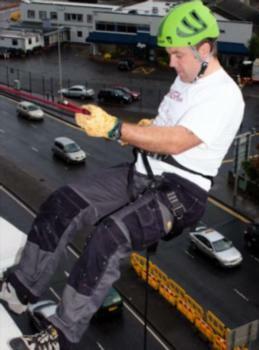 We were then invited to the regional BNI Big Breakfast incorporating the ‘Getting High on Business’ Abseil from the rooftop of the Ramada Encore Hotel in Belfast.